One more Austen in August post because I love Austen! So here are a few of my favorites, in no particular order. Pride and Prejudice // starring Jennifer Ehle and Colin Firth // Worth every minute of its 6 hour run time. Just a beautiful adaptation of the classic story. The look Elizabeth and Darcy share across the room at Pemberley is timeless. Persuasion // starring Amanda Root and Ciarán Hinds // One of my favorite Austen adaptations ever. I just love this story, and I think these actors create the love story of Anne and Captain Wentworth so beautifully. 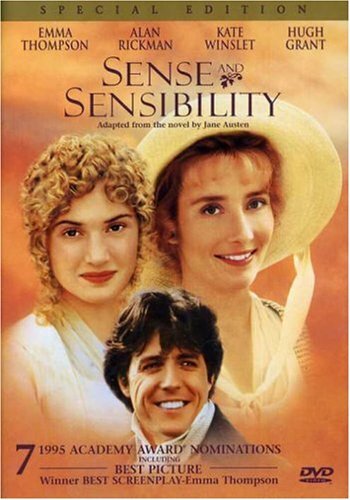 Sense and Sensibility // starring Emma Thompson and Kate Winslet // A beautiful adaptation of the tale of passion for life versus living in the proper way. My favorite scene is when Emma Thompson unexpectedly cries when Hugh Grant (Edward Feris) proposes to her. 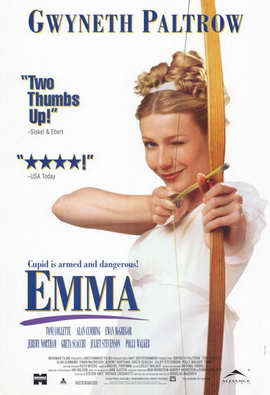 Emma // starring Gwyneth Paltrow // Just a lovely adaptation of the classic match maker story. I love how the characters interact, how ridiculous Emma’s matching making is, and that Ewan McGregor plays Frank Churchill. Emma // starring Kate Beckinsale // Another great adaptation of Emma. I love the moment that Emma realizes she loves Knightley. Just beautiful. Becoming Jane // starring Anne Hathaway // I love this version of how Jane Austen began her writing career. The love story is exciting but sad. My favorite parts are when we hear the words of Austen’s books as she begins composing them. 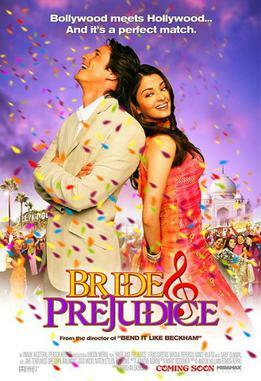 Bride and Prejudice // starring Aishwarya Rai Bachchan and Martin Henderson // Such a fun adaptation. We get the Pride and Prejudice story in modern day India. Oh, and it’s a musical. So fun! Death Comes to Pemberley // starring Anna Maxwell Martin and Matthew Rhys // Based on P. D. James’ novel of the same name, this mini series follows the story of the Darcys after their marriage when Wickham is accused of murder on their estate. A well produced story of love, trust, family, and truth. Pride and Prejudice: A Latter Day Comedy // starring Kam Heskin and Orlando Seale // A fun and cute LDS adaptation of the classic story. Set in modern day Provo, Elizabeth is an aspiring writer who must learn to love rich and British Darcy (who is also her publisher). Austenland // starring Keri Russell // I have referenced this book by Shannon Hale before here. Such a funny adaptation showing the ridiculous antics of a true Austen fanatic. She goes to Austenland where she reenacts life from Austen’s novels and learns more about how to let Austen go. On my list to watch: The Lizzie Bennet Diaries // starring Ashley Clements // Looking forward to watching this award winning YouTube series about a modern Elizabeth Bennet video blogging her life. What are your favorite Jane Austen adaptations? I think Bride and Prejudice is so fun! And I am glad you prefer that one as well–so much better! Thanks for stopping by. I love so many of these… and have to say that Bride & Prejudice is one of my guilty pleasures that I need to rewatch at least once a year! I love Clueless too, and actually want to do an Emma/Clueless marathon sometimes soon. Nice post! Thanks for stopping by! I love that Bride and Prejudice is your guilty pleasure. So fun! Ah, I forgot Clueless! Sounds like a great marathon!